Chris Jamison performs in the Lawrence Hall Ballroom on campus. 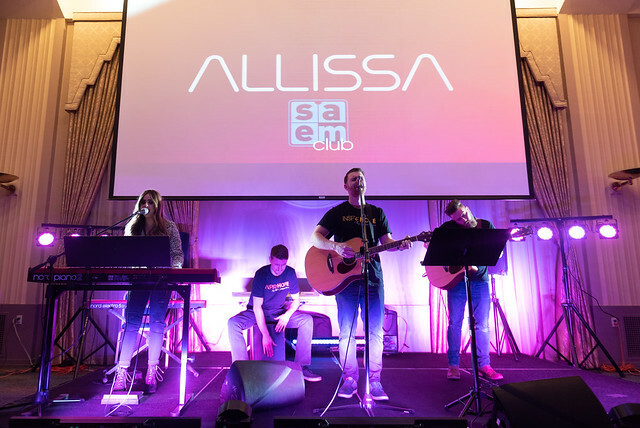 Chris Jamison, finalist on the TV show The Voice, headlined the SAEM Club Spring Concert, which also featured The Brighton Boys and Pioneer Records 2018-19 winner Allissa Logsdon, a senior SAEM major. 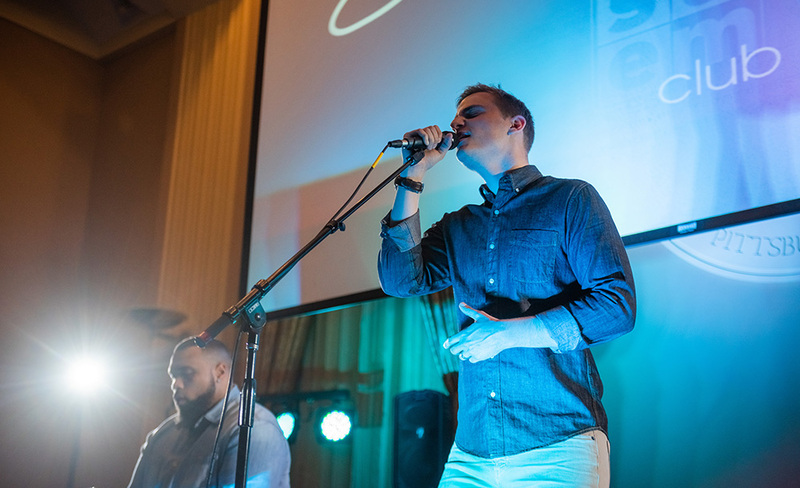 “I knew Chris Jamison is who I wanted for this year’s SAEM Club Spring Concert based on his time on The Voice and his career after, as well as him being an artist from Pittsburgh! I did my research and booked him back in September,” explained Nate Grossi, SAEM Club president and junior SAEM major from Tuscarawas Valley High School in Zoarville, Ohio. As entertainment coordinator for the SAEM Club, Grace Offerdahl assisted Grossi in running the entire event and organizing volunteers. “I learned that it is important to plan every single aspect when doing events. Always prepare for the worst possible outcome. Thankfully, nothing went wrong at the show, but we had a backup plan just in case,” said Offerdahl, a sophomore from Austintown Fitch High School in Austintown, Ohio. On the performance side, Logsdon also had a very positive experience. “I had such a great time performing at the SAEM Spring Concert! The audience was great, and it was a super relaxed, fun show. Chris Jamison and The Brighton Boys are so talented, so it was an honor to be able to perform alongside them. I'm so grateful that the SAEM Club chose me to open for this show!” she said.